Tall, native biennial with yellow flowers June to September. Prefers sunny, dry sites and happy on chalk. Medium, native perennial with yellow flowers June to August. Most soils, but prefers sunny site. Tall native perennial with pinky white flowers from July to September. Prefers damp, partly shady sites. Tall, native, bulbous perennial with green/white flower spikes from June to July. Prefers damp site in sun or semi-shade. Edible flowering shoots. Medium native perennial with yellow dandelion-like flowers from July to October. Prefers a sunny site. Small native perennial with red flowers from May to September. Prefers a damp/wet and partly shady site, such as the edge of a pond. Short native perennial with yellow flowers from June to August. Prefers a shady site. Medium height, shrubby, traditional culinary herb with strong lemon scent. Leaves used in salads and drinks. Excellent bee plant. Prefers sunny site. Low-growing perennial with aromatic leaves. The pale purple flowers appear between May and August. Prefers sunny, dry site. Low, trailing native perennial with white flowers from June to September. Prefers shady or partly shaded sites. Low native perennial with bright yellow flowers from July to September. Sunny or partly shaded sites. Small/medium native perennial with white flowers from June to August. Prefers a damp/wet site, such as the edge of a pond. Mixture of wild flowers that are attractive to bees and other nectar seeking insects. Includes Bird’s Foot Trefoil, Cornflower, Evening Primrose, Field Scabious Foxglove, Lady’s Bedstraw, Lsr Knapweed, Oxeye Daisy, Red Campion Viper’s Bugloss seeds. Mixture of wild flowers that have been selected to attract birds to your garden. Includes Bird’s Foot Trefoil, Agrimony, Wild Carrot, Field Scabious, Selfheal, Teasel, Salad Burnet, Lesser Knapweed, Oxeye Daisy, Yarrow seeds. Medium native perennial with clusters of deep purple bell-shaped flowers from May to October. Prefers sunny site. Medium naturalised perennial with spike of drooping purple or blue bell-shaped flowers from July to September. Prefers shady or semi-shady site. Tall, native perennial with blue flowers from July to September. Suitable for partly shaded, damp sites. Medium, native perennial with blue flowers from July to September. Suitable dry, sunny or partly shaded sites. Medium, naturalised perennial with pink flowers from June to September. Suitable for most soils & sunny or partly shaded sites. Medium growing native perennial with pea-like yellow flowers May to September. Prefers damp areas. Low growing native perennial with pea-like yellow flowers May to September. Prefers dry alkaline soils. Medium, native perennial with spike of rose pink flowers from late spring to autumn. Native perennial of medium height with white flowers from May to August. Prefers sunny sites. Short, rare native perennial with magenta flowers from June to August. Prefers dry alkaline soils. Small, native perennial with deep blue, fragrant flowers from April to May. Prefers shady or partly shaded sites. This is the native British Bluebell. Tall, naturalised annual with intense blue star-like flowers from June to August. Self-seeds freely. Although not native, it has long been used for its' medicinal properties. Suitable well-drained, sandy soils. Low, creeping native perennial with blue/purple flowers from May to July. Prefers damp, semi-shady site. Tall native perennial with dark crimson flowers from June to September. Prefers damp, sunny or partly shady sites. Medium native perennial with dark crimson flower heads from May to August. Tolerates dry alkaline soils. Medium native perennial with white flowers from June to August. Prefers dry, chalky sites. Medium native perennial with bright yellow flowers from May onwards. Prefers sunny sites, but thrives on most soils. Mixture of wild flowers that are attractive to butterflies. Includes Salad Burnet, Meadow Cranesbill, Gtr Knapweed, Musk Mallow, Oxeye Daisy, Field Scabious, Kidney Vetch, Lady’s Bedstraw, Selfheal, Lesser Knapweed, Yarrow, White Campion & other seeds. Tall, native perennial with white flowers from July to October. Prefers damp sites. Native biennial/perennial of medium height with bright red flowers from May to July. Prefers light shade. Low native coastal perennial with white flowers from June to August. Prefers dry sites. Native biennial/perennial of medium height with white flowers from May to September. Prefers sunny sites. Medium, native annual with white to pale lilac flowers, from May to August. Prefers sunny sites. Tall native biennial with frothy white flowers from June to August. Prefers dry sunny sites and tolerates chalky soils. Medium native perennial with yellow dandelion-like flowers from June to October. Prefers a sunny site. Medium native perennial with yellow flowers from May to October. Prefers a shady site. Mixture of wild flowers which are adapted to growing on chalky soils. Includes Lssr Bird's Foot Trefoil, Dropwort, Gtr Knapweed, Lady's Bedstraw, Oxeye Daisy, Salad Burnet, Kidney Vetch, Selfheal, Wild Carrot, Wild Marjoram, Field Scabious, Yarrow seeds. Creeping native perennial with white daisy-like flowers from June to July. Aromatic leaves. Used for chamomile lawns. Prefers a sunny site. Medium native annual with yellow flowers from May to July. Prefers a sunny site. Short native perennial with scented pink flower from June to July. Prefers a dry, sunny site and prefers chalky soils. Tall native perennial of with bright blue flowers from July to August. Prefers sunny sites on dry, alkaline soil. Short native perennial of with yellow flowers from June to September. Prefers a sunny site. Medium height native perennial with violet-blue flower spikes from June to August. Prefers sunny sites. Prefers chalky soils. Mixture of wild flowers which are adapted to growing on clay soils. Includes Lssr Bird's Foot Trefoil, Cowslip, Lssr Knapweed, Lady's Bedstraw, Oxeye Daisy, Red Clover, Tufted Vetch, Selfheal, Meadow Cranesbill, Common Sorrel, Devil's Bit Scabious, Yarrow seeds. Native perennial climber with greenish white flowers from July to August followed by fluffy white 'old man's beard' seed heads from Sept to December. Prefers chalky soils. Short, native annual with pale rose pink flowers which look like rabbit’s or hare’s feet. Flowers from June to September. Prefers sandy, slightly acidic soils. Native perennial with reddish-purple flowers from May to September. Prefers sunny sites. Tolerates chalky soils. Short native perennial with yellow flowers from June to July. Prefers a shady damp site. Short native perennial with white flowers from May to November. Prefers sunny sites. Tolerates chalky soils. Short native perennial with red flowers from May to September. Prefers a sunny situation. Tall, native perennial with purply-pink flowers with cream centre from July to September. Prefers a damp site, such as the edge of a pond. Small native perennial with yellow flowers from March to April. Prefers a sunny site. Native medium perennial with attractive deep purple flowers from May to July. Prefers damp, shady site. Low, creeping native perennial with upright flowering stems of blue flowers from May to August. Prefers a dry site. 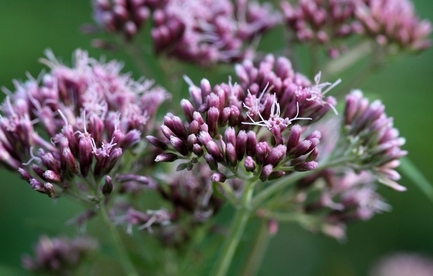 Tall native perennial with lilac-pink flowers from June to September. Prefers sunny site. Native cornfield annual with bright scarlet red flowers from May to October. Prefers sunny sites. Symbol of First World War Remembrance Day. 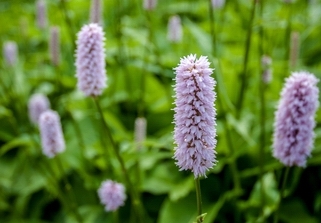 Short to medium native perennial orchid with spires of pink flowers from June to July. Prefers sunny site on alkaline or neutral soil. Tall native perennial with pale pink flowers from June to August. Unusually, tolerates dry or damp and sunny or partly shaded sites. Native annual/biennial of medium height with white daisy-like flowers from June to September. Prefers sunny sites. Cornfield annual of medium height with large yellow flowers from May to September. Prefers sunny sites but tolerates shade. Cornfield annual of medium height with striking magenta flowers from May to September. Prefers sunny sites but tolerates shade. Annual wild flower seed mixture (Field Poppy, Cornflower, Corncockle, Corn Marigold, Corn Chamomile) which will give a colourful display in one growing season from an autumn or spring sowing. Grows well on most soil types, but prefers a sunny site. Annual wild flower seed mixture (Field Poppy, Cornflower, Corncockle, Corn Marigold, Corn Chamomile, Field Forget-me-Not, Night-Flowering Catchfly & Thorow Wax) which will give a colourful display in one growing season from an autumn or spring sowing. Grows well on most soil types, but prefers a sunny site. Native annual of medium height with striking bright blue flowers from May to September. Prefers sunny sites. Mixture of wild flowers which are suitable for growing in a cottage border. Includes Salad Burnet, Gtr Knapweed, Corncockle, Cornflower, Oxeye Daisy, Corn Marigold, Field Poppy, Field Scabious, Lilac Poppy, White Campion, Night-Flowering Catchfly, Musk Mallow seeds. Native biennial/perennial. Tall plant with large quantities of frothy, white flowers from April to June. Prefers semi-shade. Native perennial. 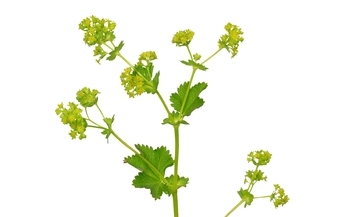 Small plant with nodding, yellow flowers in April and June. Prefers sunny sites. Medium native perennial with mauvish-pink flowers over from May to August. Prefers semi-shaded sites. Medium native perennial with large, bright blue flowers over an inch across from June to September. Prefers sunny sites. Medium native perennial with mauve blue flowers over an inch across from June to July. Prefers damp, semi-shade. Small, creeping native perennial with yellow flowers from June to August. Suitable for boggy areas as well as in pond margins up to 5cms. Medium native perennial with white flowers from June to September. Good water conditioner suitable for pond margins. Planting depth up to 60cm. Medium native perennial with white flowers from June to August. Prefers dry, sunny site and alkaline soils. Medium native perennial with lilac pink flowers from April to June when the first cuckoo starts to call. Prefers a damp, sunny or partly shaded site. Small native perennial with white flowers all year round! Prefers sunny site. Medium native perennial with white daisy-like flowers May to October. Prefers sunny sites but thrives on most soils. Medium height old-fashioned, cottage garden plant with rounded clusters of violet, pink or white flowers from May to July. Perennial/biennial. Similar to stock and fragrant at night. Prefers a damp, sunny site. Short native perennial with bright yellow sun-like flowers throughout the year, but in greatest profusion from April to June. Prefers sunny sites. Medium native annual/biennial with rose red flowers from May to September. Prefers a dry, sunny site. Medium native perennial with lavender-coloured flowers June to October. Prefers damp, partly shady or sunny sites. Small native perennial with blue purple flowers from April to June. Prefers semi-shaded site. Medium native perennial with white flowers from May to August. Prefers dry, sunny sites. Tall native biennial with yellow flowers from June to September. Prefers a sunny site and chalky soils. Tall non-native perennial with bright yellow flowers from July to August. Suitable for sunny site. Good nectar plant. Medium height native perennial with white flowers which appear from June to August. Prefers shady sites. Tall biennial with large yellow flowers from June to September. Not native but widely naturalised. Prefers a dry sunny site & tolerant of chalk. Tall, native biennial with white flowers from July to September. Stems contain white milky sap when young. Prefers a boggy site. Medium height perennial with white daisy-like flowers which appear from July to August. Prefers sunny sites. Small native perennial with creamy white flowers from May to September. Medium native perennial with lavender-coloured flowers June to September. Prefers sunny sites. Tall native perennial flowering from June to September with small purply yellow flowers. Suitable for boggy areas as well as in pond margins up to 10cms. 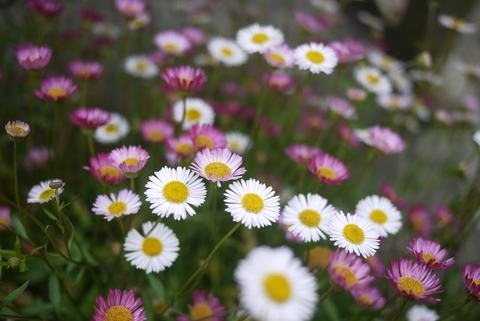 Trailing perennial with small white daisy-like flowers, tinged with pink as they mature. Flowers throughout summer. Naturalised on many ancient stone monuments. Prefers dry, sunny or part shady site. Medium height native perennial with bright yellow flowers from August to September. Suitable for boggy & wet areas. Available as bare root plant or plug. Available late March to September. Mixture of wild flowers which are suitable for growing in a lawn. Includes Lssr Bird's Foot Trefoil, Gtr Hawkbit, Lady's Bedstraw, Oxeye Daisy, Cowslip, Common Sorrel, Selfheal, Catsear, Ribwort Plantain, Meadow Buttercup, Daisy, Kidney Vetch, Yarrow seeds. Tall native perennial with rose-pink flowers from June to September. Suitable for boggy area or pond margins up to 50cms. Prefers a sunny site. Plug or bare root. Small native annual with blue flowers from April onwards. Prefers sunny, well drained sites. Medium native perennial with blue flowers from May to September. Suitable for boggy areas as well as in pond margins up to 10cms. Small to medium native perennial with blue flowers from April to September. Prefers shady or partly shaded, damp site. Medium introduced perennial with orange daisy-like flowers June to September. Prefers sunny sites. Native biennial with bell-shaped, pink/purple flowers from May to September. Tolerates light shade. Native perennial with chequered-purple flowers appearing in April and May. Occasionally, some of the flowers vary in colour from pink or brownish purple to white. Prefers damp/wet, sunny or partly shady site. 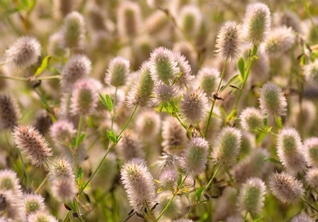 Medium height, native perennial with reddish-brown flower spikelets from June to October. Aromatic rhizome. Suitable for boggy conditions as well as in pond margins up to 10cms. Medium native biennial with white flowers from April to August. Prefers damp, shady or partly shaded sites. Native perennial of woods and shady places preferring damp conditions. White star-shaped flowers from April to June. Low, creeping native perennial with blue flowers from March to August. Prefers a shady site. July to September. Suitable for partly shaded, damp sites. Medium native perennial with pale yellow globular flowers from May to August. Prefers damp, partly-shaded or sunny site. Tall native annual to perennial with yellow flowers from June to July followed by large seed clocks. Prefers dry, sunny sites. Medium native perennial grass flowering from June to July followed by shaking seed heads. Prefers sunny site and tolerates alkaline soil. Medium/tall native with thistle-like, pink/purple flowerheads from July to September. Medium native perennial with small white star-shaped flowers from April to June. Thrives in shady, damp sites. Medium native perennial with pink flowers from June to September. Suitable for boggy areas as well as in pond margins. Prefers partly shaded site. Medium to tall native perennial with yellow flowers from June to October. Prefers damp, partly shaded site. Native evergreen perennial rush with blue-green cylindrical stems & brown flowers from June to August. Suitable for boggy conditions as well as in pond margins up to 5 cms. Native perennial with bell-shaped, blue flowers from July to September. Tolerates light shade. Medium native perennial with yellow dandelion-like flowers from June to October. Prefers a dry, sunny site. Medium, native annual hemi-parasite of grassy areas with golden yellow flowers from May to August. Helps establish wild flower meadows by reducing vigour of grasses. Medium native annual/biennial with white flowers from July to September. Prefers dry, shady, partly shaded or open sites. Medium native perennial with red flowers from July to August. Prefers damp, shady or partly shaded sites. Mixture of wild flowers which are adapted to growing in light shade. Includes Wild Basil, Red Campion, Cowslip, Hedge Woundwort, Hedge Bedstraw, Oxeye Daisy, Tufted Vetch, Selfheal, Wood Avens, White Campion, Yarrow seeds. Medium native biennial with pink flowers from May to September. Prefers a shady site. Tall, native biennial with yellow flowers July to August. Prefers sunny, dry sites and happy on chalk. Small native perennial with pale pinkish-purple, vanilla-scented flower spikes from June to August. Prefers a well-drained, sunny site. Native, coastal perennial with architectural stiff, spiny, blue-green leaves with silver veins. Clump forming. Purple flower heads June to September. Tall, widely naturalised biennial with lilac flowers from May to July followed by shiny, silver translucent discs. Prefers a partly shaded or sunny site. Native perennial climber with separate male & female plants, which flower from July to August. Female flowers are yellow/green 'cones' & used in beer making. Prefers a shady site. Short native perennial with yellow flowers from May to July. Prefers a sunny site with dry, chalky soil. Medium native perennial with yellow iris flowers from June to August. Prefers a sunny or partly shaded site with damp soil, such as by a pond edge. Tall native perennial with purple flowers from June to July. Prefers a semi-shaded site on chalk soils. Low native perennial. Flowers may be yellow, red or purple in dense heads from May to September. Medium native perennial with thistle-shaped, pink/purple flowers from June to September. Native, architectural perennial with palmate leaves and sprays of tiny yellow/green flowers from May to September. Prefers damp soils.. Tall native biennial with red-purple flowers from July to September. Prefers dry sunny or partly shady sites. Native creeping perennial with yellow flowers from June to August. Suitable for boggy conditions as well as in pond margins up to 20 cms. Small native perennial with small white star-shaped flowers from May to August. Thrives in sun or part shade. Naturalised annual poppy with lilac & purple flowers from June to October. Prefers sunny sites. Medium, native annual with red flowers from June to July. Prefers dry, sunny sites. Mixture of 24 different wild flowers which will give a colourful display over a long season. Includes Agrimony, Gtr Knapweed, Lady's Bedstraw, Oxeye Daisy, Cowslip, Musk Mallow, Selfheal, Wild Carrot, Catsear, Dark Mullein, Field Scabious, Yarrow seeds. Tall native perennial with red-purple flowers from June to September. Prefers wet/damp site in sun or part shade. Tall native perennial with yellow flowers from July to August. Prefers a site with damp soil, such as by a pond edge.